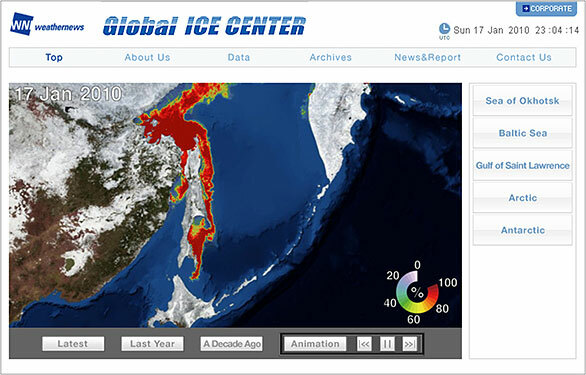 WNI Global Ice Center – Sea Ice Outlook, Winter 2010 Effects of the Arctic Oscillation expected to be seen in the Bohai Sea and the Baltic Sea – Weathernews Inc.
Weathernews Inc. (WNI, Tokyo, CEO: Chihito Kusabiraki)'s Global Ice Center has issued an analysis of global sea ice in January 2010 as well as an outlook for this winter season. Looking at the entire northern hemisphere, we can see that the Arctic Oscillation is exhibiting a negative phase, resulting in an influx of Arctic air down to the Bai of Bohai and the Baltic Sea, which in turn is creating ice conditions more severe than average. The same is true in reverse over the Gulf of Saint Lawrence and the Arctic Ocean, where warmer temperatures are resulting in less-than-average sea ice coverage. Sea ice over the Sea of Okhotsk is expected to increase compared to last winter, and be closer to recent average values. 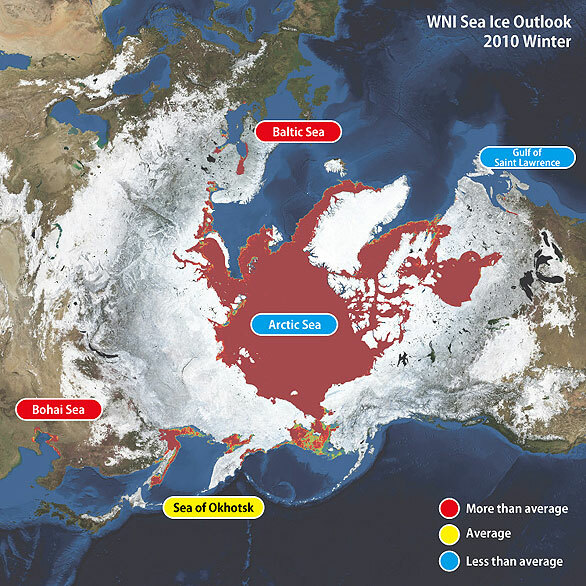 Northern Hemisphere Sea Ice Conditions as of January 15, 2010, as analyzed by the WNI Global Ice Center. Sea ice over the Sea of Okhotsk began forming in the northern area late November 2009, and has expanded. Currently the ice extends down to about 30km off the northern coast of Hokkaido. The outlook is for the area of coverage to continue to expanding, reaching its maximum area around March 2010. Recent research shows that the largest area of sea ice coverage over the Sea of Okhotsk is determined by the autumn air temperature in the north, where sea ice starts to form, as well as the sea surface temperature off Kamchatka in early winteri. According to this, the area of sea ice is forecast to be larger than last season, near seasonal average levels, and cover about 75% of the entire Sea of Okhotsk. Due to the effect of the strong polar air mass that descended over Europe, the northern portion of the Gulf of Bothnia, Gulf of Finland and Gulf of liga are covered by sea ice. In addition, many coastal areas have also started to freeze over, as well. This level of sea ice coverage in January is only seen once in about every 10 years. If the polar air mass remains in place, there is the possibility of seeing record breaking ice coverage, including a total coverage of the Gulf of Bothnia. The air temperatures over the Gulf of Saint Lawrence are higher than the average year. As a result, sea surface temperatures are also comparatively high. Presently, sea ice is only seen near the mouth of the Saint Lawrence River and over limited coastal areas. Freezing is expected to continue into February and March, but maximum ice coverage is forecast to remain below seasonal averages. Due to several cold air outbreaks since late 2009, the Bohai Sea is seeing record-breaking sea ice this season, such as sea ice thickness of over 50cm, which is rare for this region. We continue to forecast more Arctic air, which in turn is expected to cause even more freezing. There is a risk of serious effects for shipping in the region. The sea ice over the Arctic Ocean in summer 2009 was analyzed as the third smallest area since observations began. 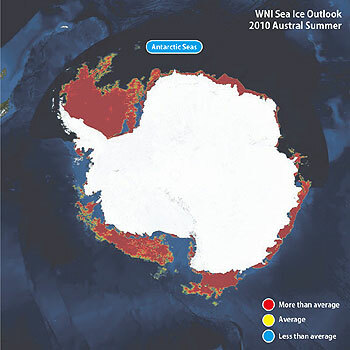 The ice began to increase toward the beginning of the winter season, but as of January 2010, the total area of coverage is about 10% less than the seasonal average. The reason is believed that the current Arctic Oscillation pattern is bringing higher-than-average air temperatures to the region this season. Southern Hemisphere Sea Ice Conditions as of January 15, 2010, as analyzed by the WNI Global Ice Center. The Antarctic Ocean in now in the summer season, and the area of ice coverage is approximately 450 square kilometers, which is slightly less than average for the season. The outlook is for the area of coverage to shrink to its lowest level this season in late February, to about 250 square kilometers.